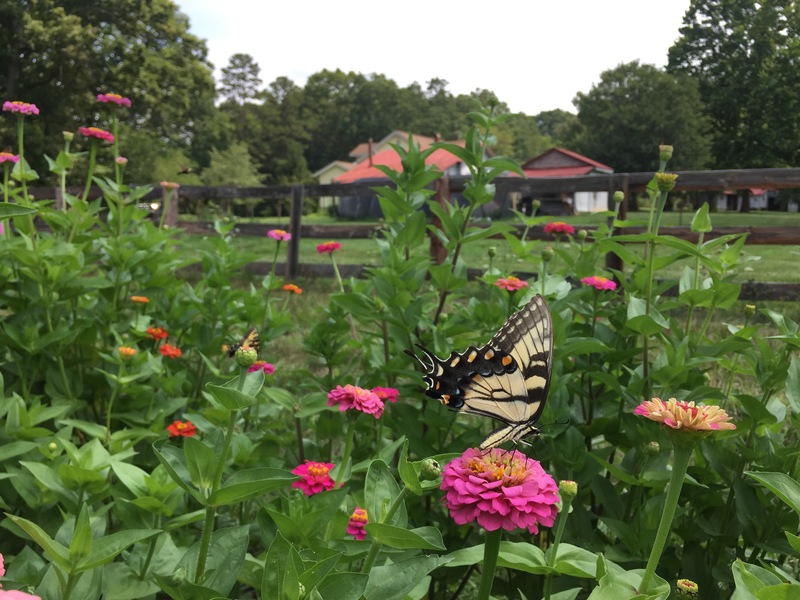 Farmhaven – Page 2 – Feeding your need for fresh food and beauty with naturally grown herbs, heirloom vegetables and old fashioned flowers. We grow ugly tomatoes but you make them look good plated up. Our thanks goes out to all of the people who buy local, especially the very nice people who stop and buy Farmhaven vegetables and flowers. 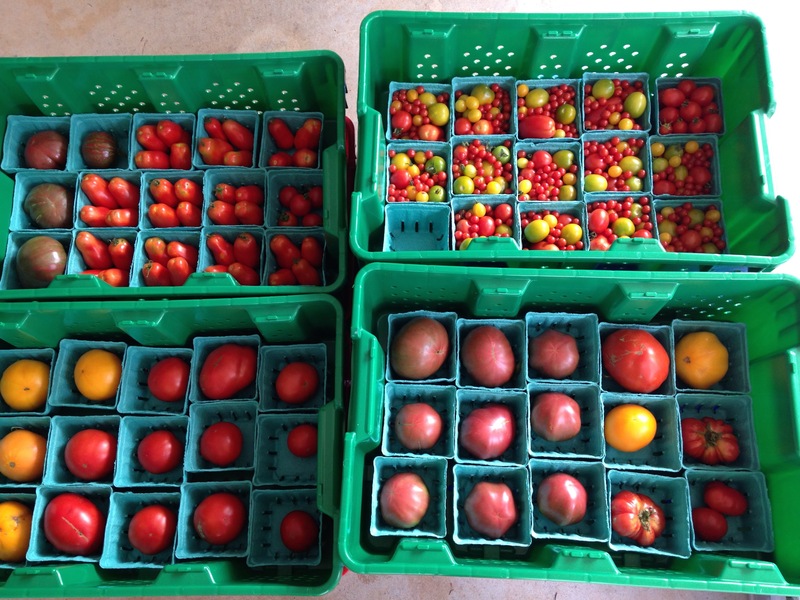 We got an email from a lovely customer after the King market last week that showed exactly what happens to some of our tomatoes. We loved the photo and the recipe. It made us happy & a little hungry. Marinating uncooked tomato sauce. 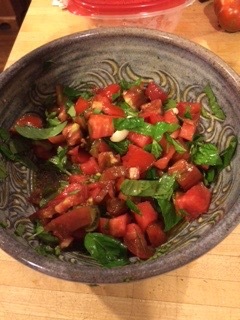 This beautiful dish includes a few Farmhaven tomatoes. Wash and wipe the tomatoes. Remove the cores from the tomatoes. Chop the tomatoes. There should be about 6 cups. Put them in a large bowl. Add the garlic, chopped chili, basil, salt, pepper, olive oil. Let stand at room temperature several hours. Or chill overnight. But let return to room temperature before serving. Meanwhile, grate or shred the Fontina, using the coarse blade. When the pasta is cooked, drain it. Spoon off about 1/4 cup of the surface oil from the tomatoes and add it. Add the Parmesan cheese and toss. Add half the tomato sauce and toss. Add half the remaining sauce and Fontina cheese and toss. Serve in soup bowls with remaining sauce spooned on top. Bringing a medley of heirloom tomatoes. Ripe. 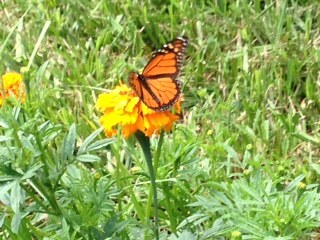 Naturally and sustainably grown in our market garden. Why Heirloom? Because of the variety of wonderful tastes. Featuring… Black Krim, Italian Heirloom, Rosso Siciliano, Nebraska Wedding, Berkley Tie Die, Jacinthe Jewel, Martino Roma, Sioux, Dr. Wyche’s Yellow, Sweet Pea Current, Blonderkopchen, Principe Borghese, Green Grape. 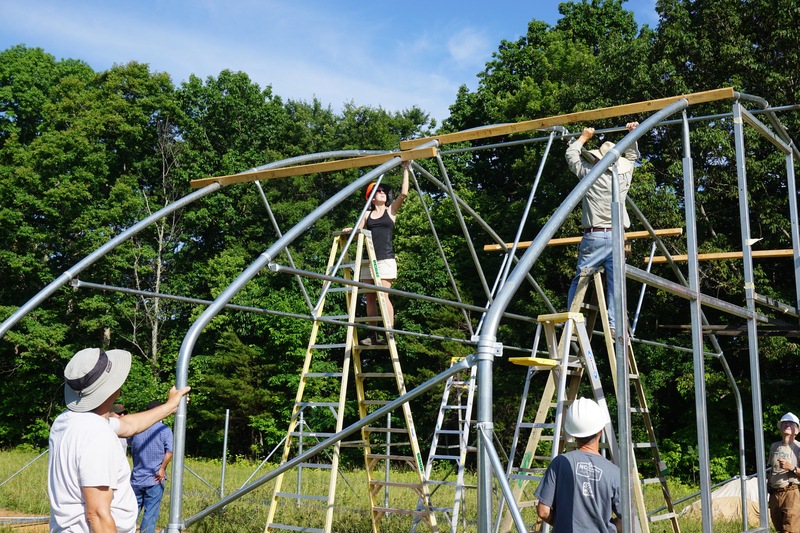 Love and encouragement were given to us by the helping hands of friends and family when we put up a 30’x48′ moveable high tunnel. The frame went up on one hot, glorious day at the end of May. When I look at it I see more than the structure. I see the faces and hear the chatter of the crew that volunteered to help us; standing on construction ladders, or bracing them, drills in hand, bolts and bits at the ready. Al’s mom brought a giant tray of delicious homemade banana pudding and my mom set out lunch. Every action lifted us up, just like the sections on that building. It’s very humbling to hear and see the answer “yes” when we need help. We are so grateful to the wonderful people working that day. What’s so great about a high tunnel? Al will tell you it’s a key part of creating a microclimate that will produce a variety of fresh food throughout the year. This is not a greenhouse with a covered floor and artificial heat. The “movable” function of this high tunnel allows crop rotation and soil rest. Instead of feet, the bottom of the high tunnel is like a sled. This is a covered winter garden, we will be growing in the soil using the same sustainable methods we practice during the summer. A chef at the King Farmers Market summed it up differently. “So, you might have dirt tomatoes late in the fall?” From her lips to God’s ear. The plan is to have dirt tomatoes and a few other things growing late into the fall. In between prepping for markets, going to markets and tying up tomatoes the day goes fast. Al and his dad are currently putting up the end walls. I help where I can. The next step will be covering it with plastic. A day when our efforts alone won’t be enough and we’ll need to ask for help. We are thankful for the friends and family that will still take our call and answer yes. Lunch and banana pudding anyone? 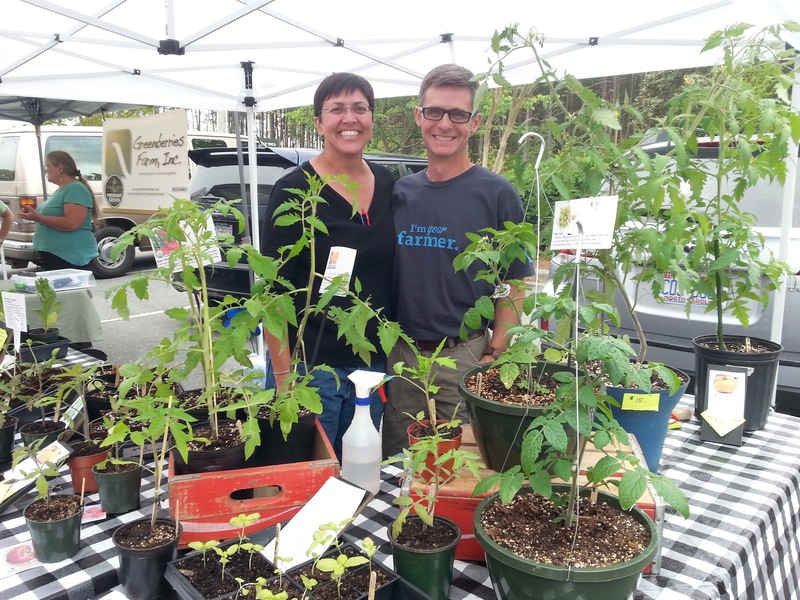 the King Farmers’ Market located at the Stokes YMCA, 105 Moore Road in King, NC, on Wednesdays from 11am – 1pm, from April 22nd through October 28th, 2015. Also at the Reynolda Village Farmers’ Market located at 2201 Reynolda Road, Winston-Salem, NC, on Fridays from 8am – 11:30am, from May 8th through October 2nd, 2015. We started with French Breakfast radishes, a wide assortment of heirloom tomato plants, edible flower transplants (calendula, nasturtium, borage), herb plants, and some beautiful Festiva Maxima Peony cut flower bunches. 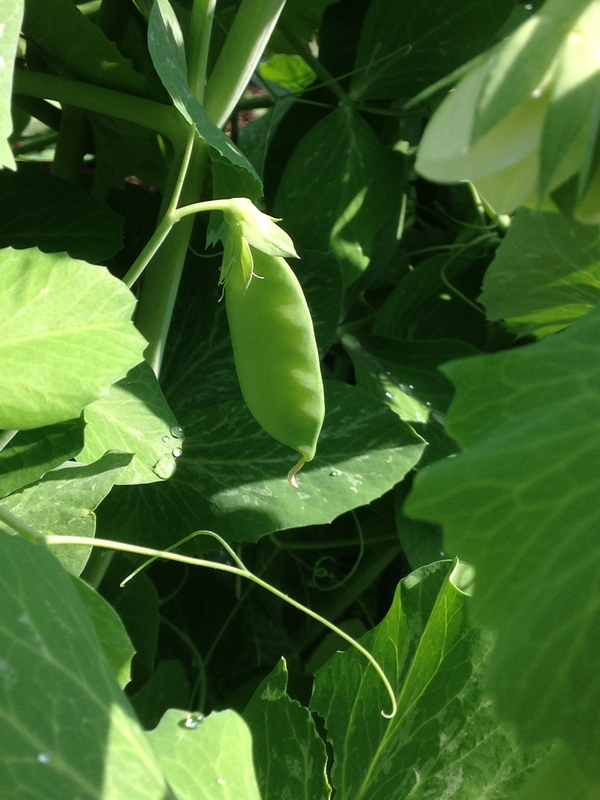 We will soon have Cascadia sugar snap peas and heirloom tomatoes. Please come see us if you are local to these markets. If not, please go find a local farmers’ market where ever you live. Buy and eat great food, and learn more about naturally and sustainably grown food. Enjoy getting to know your local farmer. While Al is always so serious, Linda is really funny.